When we think of architecture and home design, we generally think in human terms. Is our home big enough and is it in a style that we can live with? When it comes to the interior, is the furniture arranged to provide plenty of room to move around and also makes the TV easy to see from various angles ? 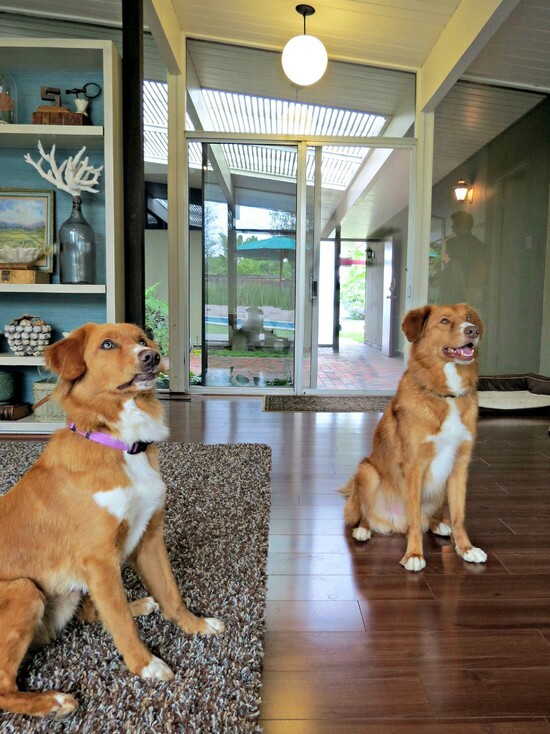 All of these elements may be important from a human point of view, but it is too easy to forget that the design and décor of a home also have an effect on its canine residents. Not only do dogs see the home from a much different, lower perspective, but they perceive it in an entirely different way. 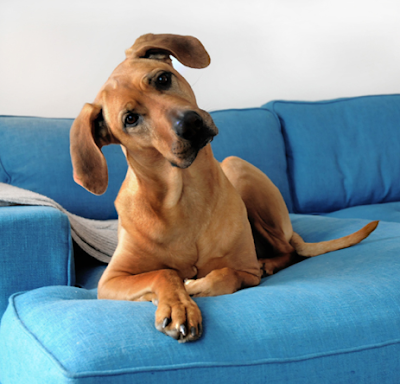 They won’t care whether your furniture, paint and curtains are perfectly colour-coordinated — but if the fabric on the sofa gives off a bad smell (to them), or there aren’t any safe places to make a den, then your dog won’t feel at home at all. 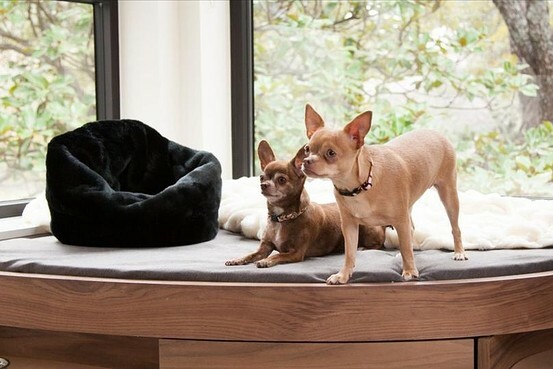 Towards that end, here are eight key elements to take into consideration when setting up your best friend’s quarters. The practicality of a dog door depends, of course, on where you live and the size of your dog. 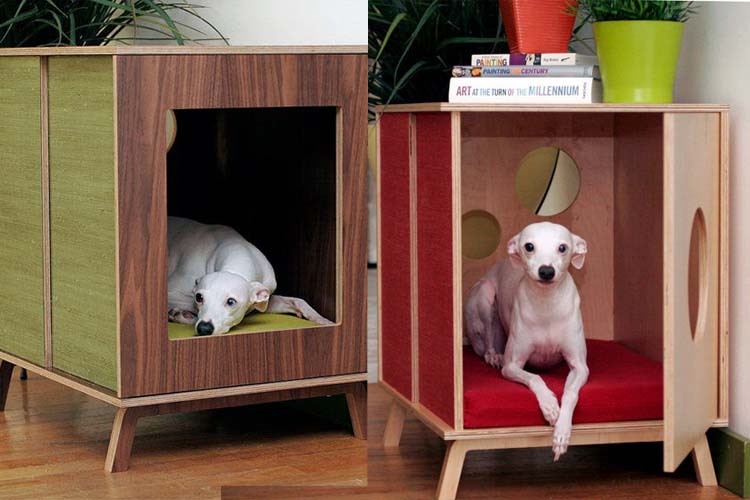 But having a built-in dog door can be a great idea for both dog and owner. If security or unwanted critters gaining access to your house is a concern, there are now models on the market that are activated by a chip on your dog's (or cat's) collar. A mud room is a luxury high on our own wishlist, but any entrance hall equipped with hooks and storage will work—as long as it can be tread upon by dirty paws and spritzed with wet fur. What you need is a resilient staging area where your dog can be cleaned and dried before being unleashed into the rest of the house. It also makes sense to keep all your dogs' walking accessories and toys in one spot to save time on a daily basis. 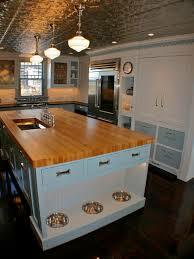 In a pet residence, the floor is the first and most important consideration. Rugs and carpets may look nice but if they have large-loop material that can easily snag on your dog’s claws, this which can unravel and potentially injure your dog. Underfloor heating is energy-efficient and any dog's favourite. Carpeting is not recommended as it's too hard to keep clean but if you must have it, select a low pile in a stain-resistant synthetic fibre or wool. Too often dog bowls are left out in the open waiting to be knocked over. When designing a new kitchen (or mud room or laundry room), build in a convenient place for the food and water bowls to live. 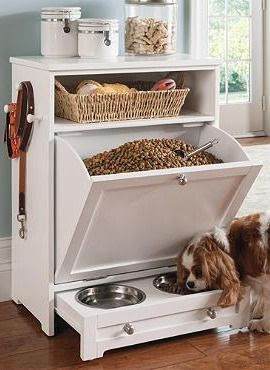 The drawers can hold all your pet supplies (leashes, collars, sprays, meds) with the bowls integrated in the lower part of the cabinet or island bench. It will become one of your greatest daily satisfactions not to mention a permanent source of amazement for your non dog-owning friends! Most manufacturers recommend storing kibble and canned foods in a cool, dry place. Most of us will use the kitchen pantry or an inside cupboard which works just fine. Bags of dog food are unwieldy, not to mention unattractive and prone to attracting vermin. Having a stylish custom-designed built-in airtight bin is ideal but an old-fashioned metal garbage can or plastic storage container also work well. A laundry sink is easy to use as a dog bath for small and medium-sized dogs so you don't have to bend over a low bathtub. If you're renovating, consider installing a dog shower with a handheld nozzle—these work well in tiled niches in mud rooms and laundry rooms. Mud rooms are these informal spaces located near a back entry - a perfect place for a dog to eat his dinner or have his dirty paws wiped clean. Dogs drool. They also shake water on walls on rainy days or after their bath. Walls painted with satin paint are much easier to clean than walls painted with flat paint. 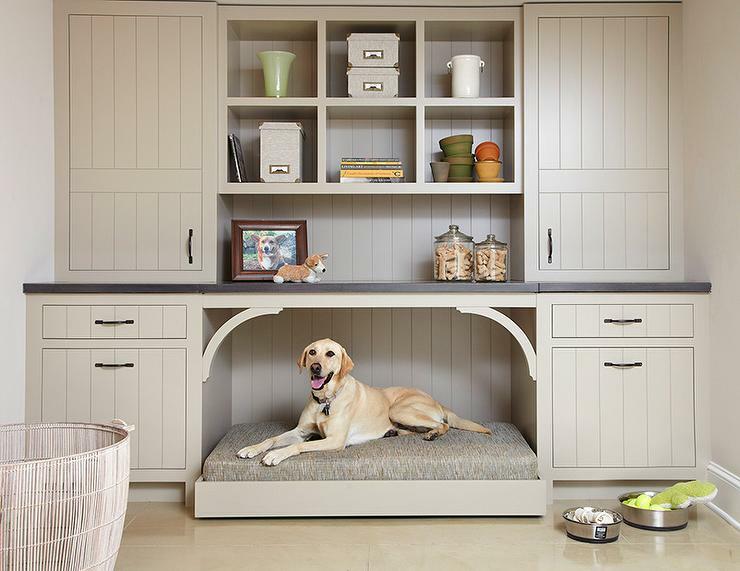 To truly design the mudroom with your dog in mind, consider painting your walls in yellow, blue or grey. These are the only colours that dogs are able to see. Greys are currently a popular colour in any home decor. Dogs don't need to be allowed on the furniture, of course, but who can resist lounging on the sofa with a furry companion? It's wise to protect the comfiest seats in the house with slipcovers in washable fabrics but for those owners wanting a sleeker, more modern look for their lounge furniture, many standard fabrics can be successfully treated for stain-resistance. Technological advances have also made a number of other upholstery options possible, including a large selection of indoor-outdoor fabrics that are durable and inherently stain, moisture and fade-proof. Forget silk or the pet-hair magnet known as velvet. Discover the joys of Crypton, a nearly indestructible, synthetic fabric that's resistant to stains, smells, bacteria and muddy paws. Then there's Ultrasuede, a machine-washable microfibre that feels as smooth and seductive as real suede. If you want to branch out into other fabrics, remember that the general rule is that tight-weave fabrics with pattern, texture, and darker colours are best for hiding pet hair and dirt. Dogs need a place to retreat to where they can sleep soundly— somewhere quiet and comfy but close to the action and free from draughts. The problem is that dog beds and crates take up a lot of space. Instead of allowing them to clutter your rooms, consider building a spot especially for your pets such as a window seat or cosy built-in niches under stairs or islands. For windows, avoid vertical mini-blinds, which can be quickly damaged as curious dogs push through them to see what’s outside. Also take precautions to tie up curtain pulls and cords so they will not be a strangulation hazard or temptation for chewing. Although dogs have been domesticated for a long time, human living spaces are quite different from the natural world they would prefer. 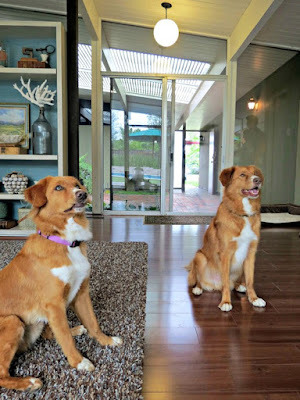 Fortunately, with a little clever adaptation by people, you can make your home feel natural for your dog, whether you live in a cabin in the woods or a high rise in the city. Making even small changes in our living environments can have a significant effect on our mutual happiness! 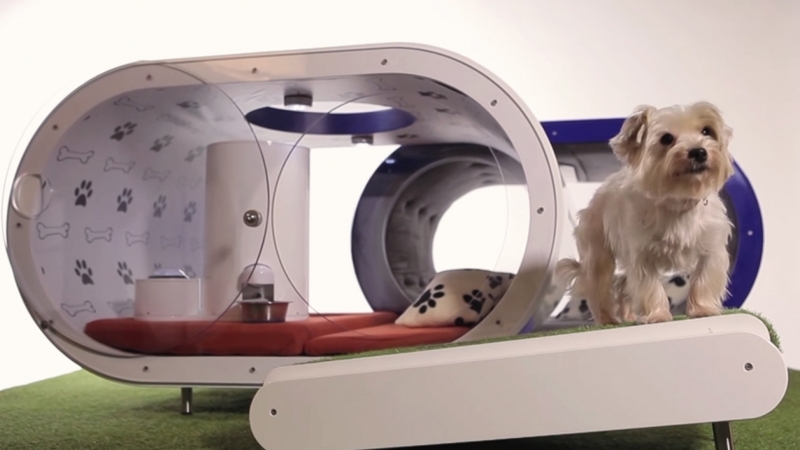 In early 2015 one lucky canine was the proud winner of Samsung’s first Dream Doghouse, a $30,000 pooch pad featuring an AstroTurf-covered treadmill, hydrotherapy pool, entertainment wall, and of course a paw-controlled snack dispenser. A team of 12 designers and builders collaborated on this project, which took six weeks to complete. On top of the treadmill and hot tub, the tiny home has a vinyl wall that can be covered with photos of the owner’s choosing, while the opposite wall features a Samsung Galaxy Tab S tablet, for whatever the dog feels like doing online.